Listed as one of Golf Digest's® Top 75 Golf Resorts in North America, The Westin Mission Hills Golf Resort & Spa is truly a golfers dream. 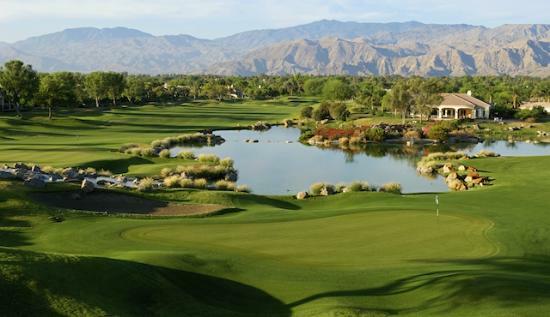 Our Palm Springs Golf Resort features two championship Troon golf courses that are available to guests, the Pete Dye course adjacent to the resort and the Gary Player Signature Course. Pete Dye is one of the game's top designers, and his designs often host major championships. Gary Player offers a wide array of expertise from winning 165 tournaments including nine major championships. 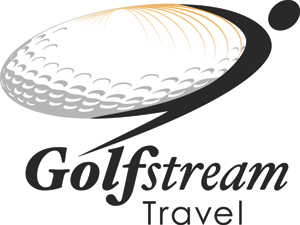 Golf Digest recently named The Westin Mission Hills Golf Resort and Spa as one of the top 75 resorts in North America. Two championship courses are available to guests, the Pete Dye course adjacent to the resort and the Gary Player Signature Course. Each course offers a completely different type of experience to challenge even the most extreme golf enthusiast and features stunning desert scape and mountain skyline views. Our Palm Springs golf resort is located at the corner of Bob Hope and Dinah Shore drives, named for two celebrities intimately associated with the game of golf. Tee times may be reserved up to 90 days out for guests of the resort. Condé Nast Traveler just released their Fourteenth Readers Choice survey and The Westin Mission Hills Golf Resort was selected as one of the Top 10 California Golf Resorts. 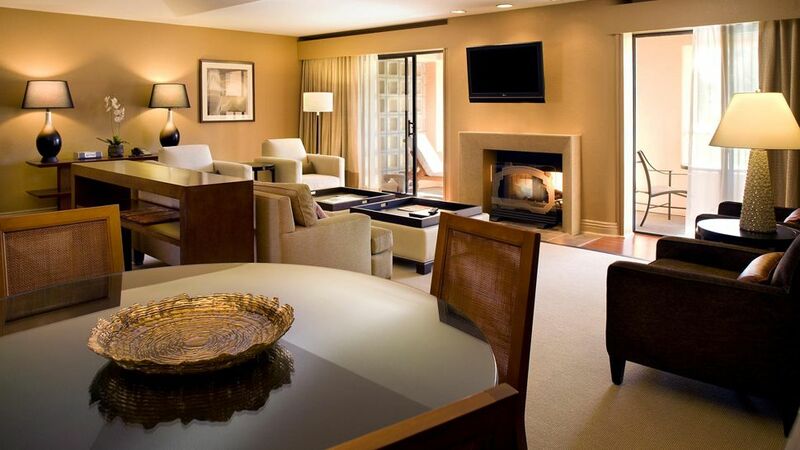 The Westin Mission Hills Golf Resort & Spa, a Palm Springs hotel provide guests with an array of accommodations. All of our oversized guestrooms & suites showcase soothing taupe tones with textured accents. You’ll enjoy an amazing night’s sleep in our Westin Heavenly Bed®, with crisp, white 250–thread count sheets and custom mattresses. A Deluxe Resort View guestroom is a perfect setting for taking in the beauty of our resort landscapes. Enjoy the luxury of fine linens with your Westin Heavenly Bed®, and renew mind and body with your signature Heavenly Bath®. Your Resort View accommodations include private patio or balcony, mini-refrigerator, mini-bar, plush sitting area and complete entertainment center. Deluxe Pool View guestrooms offer stunning views of either La Paloma or Las Hadas pools, along with the surrounding resort landscapes. Accommodations include your Westin Heavenly Bed®, Heavenly Bath® and private patio or balcony. Enjoy the comforts of a mini-refrigerator, mini-bar, plush sitting area and complete entertainment center. Wake up to the stunning views of the world famous Pete Dye signature golf course and surrounding Santa Rosa Mountains. Deluxe Golf View guestrooms offer a private balcony or patio to take in the panoramic views, along with a mini-refrigerator for your personal selections, a stocked mini-bar for your convenience and a plush sitting area and entertainment center for your enjoyment. Renew mind and body with the Westin signature Heavenly Bed® and Heavenly Bath®. 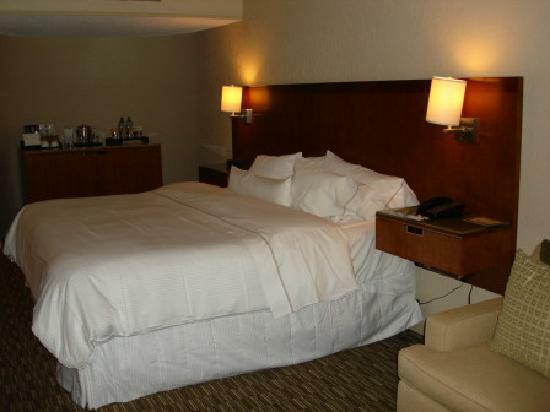 Take advantage of some additional space with our variety of suites that are designed for your needs. Choose from our Executive Studio Suite, Resort Suite, Deluxe View Suite, Presidential Suite and Chairman Suite. The desert climate awaits guests with warm, sunny days and cool evenings. Lush landscaping creates an oasis where guests of all ages can enjoy recreation opportunities ranging from Palm Springs Golf, tennis, spa, pools, and the Westin Kids Discovery Room Some of the finest activities at our Palm Springs Resort, enjoy all of the below and so much more at The Westin Mission Hills. Our resort's pet policy allows for dogs only, 40 pounds or less. Dogs may not be left alone in room at any time, nor will they be allowed in outlets or on pool decks. The patios of Fireside Lounge and Pinzmini Restaurant invite you to dine with your dog and even have a special dog menu! Dogs are not accepted at the villas. Restrictions and deposit may apply. Designed and certified by Runner's World Magazine, Runners World maps are available to our guests and feature 3-mile and 5-mile jogging/walking routes from our hotel as well as local running tips. Our run WESTIN Conceirge leads runs every Thursday morning at 6:30am at Masters Plaza. Guests will be charged a daily USD $29* resort charge. This includes overnight Self-Parking, Access to Westin Workout Fitness Studio, Wireless internet in Guest Room (up to 5 devices), Wireless internet in Public areas (excludes convention space), Complimentary Daily Resort Recreation activities (select activities not included), Day use of The Spa Facilities, Complimentary Newspaper from Monday - Friday, 15% off Merchandise from The Spa, 15% off Tennis Court Fees and Merchandise from The Tennis Pro Shop, 15% ff Merchandise from the Pete Dye Pro Shop. *Subject to change at any time. Soothe, refresh and enjoy in our three pool areas. The main pool "Las Brisas" with a free form has a 60-foot waterslide and two spas. Cabana rentals are $250 per day (fruit, select sodas and bottled water included) and our mini cabana loveseats go for $80 (bottled water included). Cabana rentals are on a first-come-first-serve basis and are rental rates are subject to change according to availability and holiday weekends. Pool attendants and servers at your disposition and service, and our unique “Caliente bar” with innovating drinks and food items and three TV’s for our sports fanatics! Also if you are in a hurry don’t forget your grab & go items at “Las Brisas Café”. “Las Hadas” pool has one spa and a bar as well, tropical drinks and food service are available and “La Paloma” pool which is our only private adult pool and spa. *Guests must be 42" or taller to ride the Las Brisas Waterslide & for safety purposes, only one passenger is allowed at a time. Seven lighted courts include a stadium court with seating. Private or group lessons are available available through our PBI Director of Tennis, Kevin Connolly. Reservations for tennis lessons or court reservations should be booked in advance by calling our tennis pro shop at 760.202.2021. The resort is located at the corner of Bob Hope and Dinah Shore drives, named for two celebrities intimately associated with the game of golf. Two championship courses are available to guests, the Pete Dye Course adjacent to the resort and the Gary Player Signature Course. Spread out over 14,000 square feet, yet still offering an intimate, boutique-style ambience, The spa offers facilities for your every desire. The 14 private treatment rooms named for native desert plants are each a soothing sanctuary, while a steam room, Jacuzzi, meditation lounge, and lush gardens offer additional quiet spaces for relaxing. Start your day off with exercise and feel the energy throughout the day. Or wind down after a long day with a refreshing workout. Our gym features state-of-the-art fitness equipment designed to accommodate a full range of exercises. Oasis Den, social hub, is fully equipped with new computer stations, lush seating, pool table, shuffle board and new flat screen TV’s at every corner. Check e-mails, play a game of pool or rest and relax while watching a little TV. Oasis Den is available seven days a week from 7:00am to midnight for guests to enjoy. Step away from the sun and tuck yourself in the Hideaway. Full of your favorite arcade games! The Hideaway is the perfect spot to stay cool and energized! Located just adjacent to the Oasis Den. 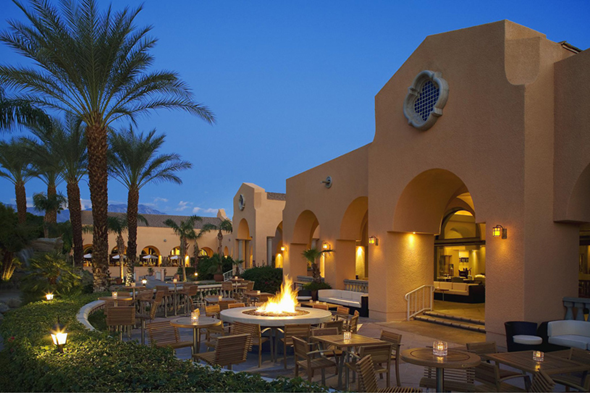 Woven among the hotel's Spanish-Moorish architecture and natural desert landscaping are Palm Springs restaurant venues ranging from Pinzimini, Fireside Lounge, Caliente Bar, Las Brisas Cabana, Hole in the Wall, Mission Hills Market & Cafe and Season's Grill. Pinzimini at The Westin Mission Hills Golf Resort & Spa has an open kitchen feel, with modern Italian flair. Savory Italian dishes to include antipasti, pizza, pasta, and panini’s will provide a culinary experience that will tantalize the taste buds. Please join us this November 27, 2014, to celebrate and give thanks with our friends and loved ones! Enjoy our Thanksgiving feast from 2:00pm to 8:00pm at Oasis Ballroom Don't forget we also have live entertainment, NFL coverage, happy hour from 4:00pm to 6:00pm, kids movies and games to keep them entertained and much more! PINZIMINI provides the guest with an experience of dining in a modern, energetic atmosphere while enjoying an italian menu featuring a variety of high-quality grilled meats, exceptional salads, and simple pastas containing accents of Tuscan-style cuisine. Pause and drink in the magnificent view of the lushly landscaped 18th hole of the Pete Dye Golf Course - the perfect setting for relaxing conversation or a casual meeting. You won't miss a single ray of warm desert sun when you grab a bite at this popular Palm Springs Restaurant. Have a seat and relax at the Mission Hills Market & Cafe. Proudly brewing Starbucks Coffee you may also enjoy fresh pastries, salads, and sandwiches are prepared daily by our very own Executive Chef Joel Delmond. The Market is fully stocked with newspapers, magazines, sundries and more for your ultimate shopping experience. Season's Grill Palm Springs restaurant features seasonally-inspired menus that take culinary creativity to the next level. Even dishes that may be considered "standard" go a little "off to the left" - in a good way! Fresh, fun, familiar.